I have seen hand lettering masters on Instagram use all different kinds of markers and pens. Dip pens, brush pens, Sharpies, water brushes – you name it. 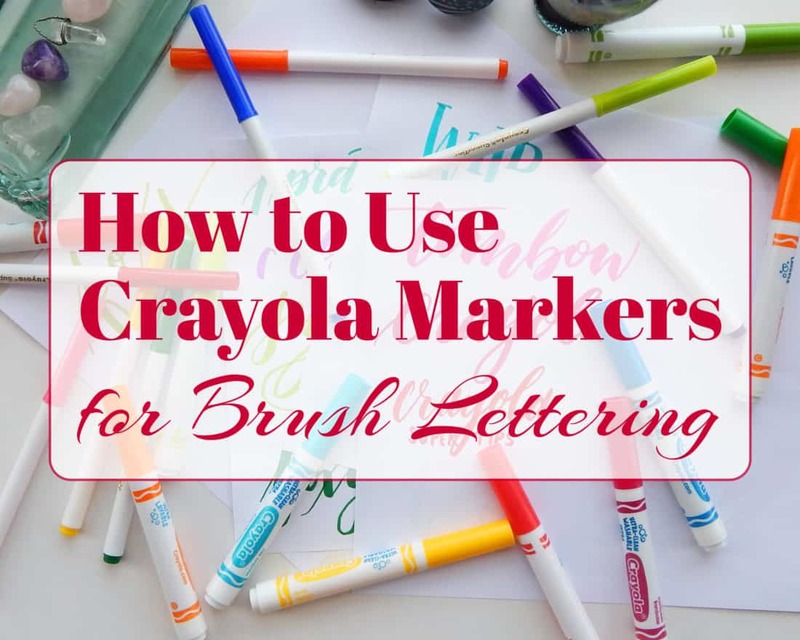 But I was more than a little skeptical when I saw people using Crayola markers for their brush lettering. Those are kid markers, right? Well, I decided to give it a shot and try modern brush lettering with the humble Crayola marker. And you know what? They are pretty awesome. 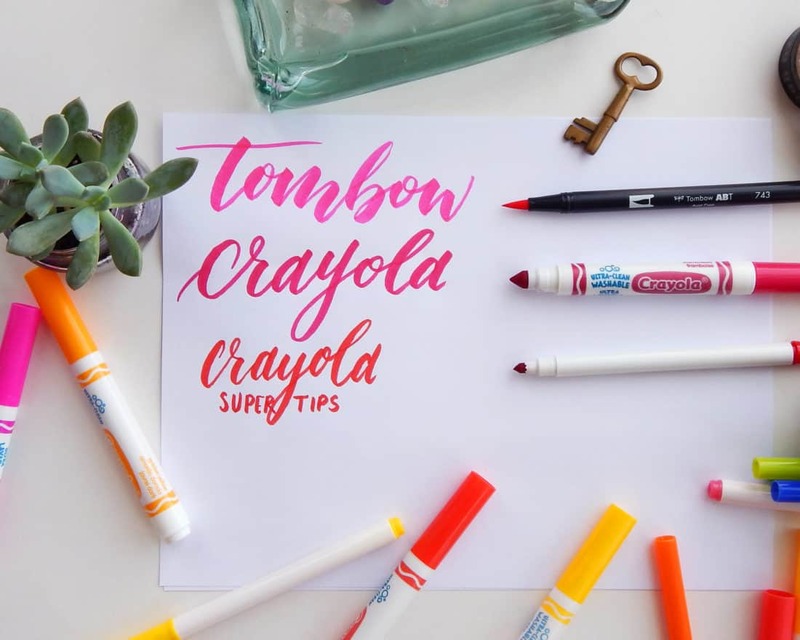 Here’s how they stack up to Tombow Dual Brush Pens and how to use them for fantastic lettering! As you’ve probably guessed, the difference between a brush pen and a Crayola marker is, of course, the tip. If you are familiar with the basic technique behind brush lettering, you know that the pen’s flex is vital. You need to have control over the thin and thick lines coming out of your marker. A brush pen has a long and flexible tip, which provides a wide range of line widths. A Crayola marker has a cone tip. It’s a little bit flexible, but at a cost. These markers weren’t built for the wear and tear of brush lettering. While you can push and get a thick downstroke, it will degrade the marker very quickly. That’s the trade-off for using Crayola markers for brush lettering over traditional brush pens. Hold the marker at a 45-degree angle to get the best brush lettering. That way, with a little practice, you can easily get thin lines with the tip of the cone and thick lines with the side of the cone. This hand position will give you the most range of possibilities for great line widths. If you’re not sure what I’m talking about, check out the video above to see the proper angle in action! The secret to making Crayola markers work for calligraphy is aggressive pressure. You have to be okay with killing your markers’ life expectancy by putting a ton of pressure on the cone tips. After a while, you will notice the tips begin to distort a bit and lose their shape. But these markers can produce lovely modern calligraphy if you are willing to make this sacrifice. Of course! You won’t be able to get it just right on your first try. It takes practice, just like regular brush lettering. It feels a bit weird at first, but it begins to feel natural in your hand over time. So don’t dismay if it’s not working at first. Just tinker, play, and practice to learn lettering quickly! If you want to learn brush lettering even faster (and with all the proper techniques from the get-go), then check out my Brush Lettering 101 course! This course was designed to help total newbies figure out the foundations of lettering so they can grow their skills quickly and with as little frustration as possible. If you’re ready to take your lettering to the next level, then Brush Lettering 101 is perfect for you! While these markers might not withstand a ton of use, they are so hilariously inexpensive that it’s easy to replace them as often as you need. That’s what makes Crayola markers an excellent option for brush lettering newbies. You can really go wild and test the limits of your markers without feeling shy about applying pressure. And if you’re wanting to try small-scale brush lettering, you can always get the Crayola Super Tips. There are tons of options that are all budget friendly for the beginner brush letterer. And the colors! Don’t even get me started on all the gorgeous colors. 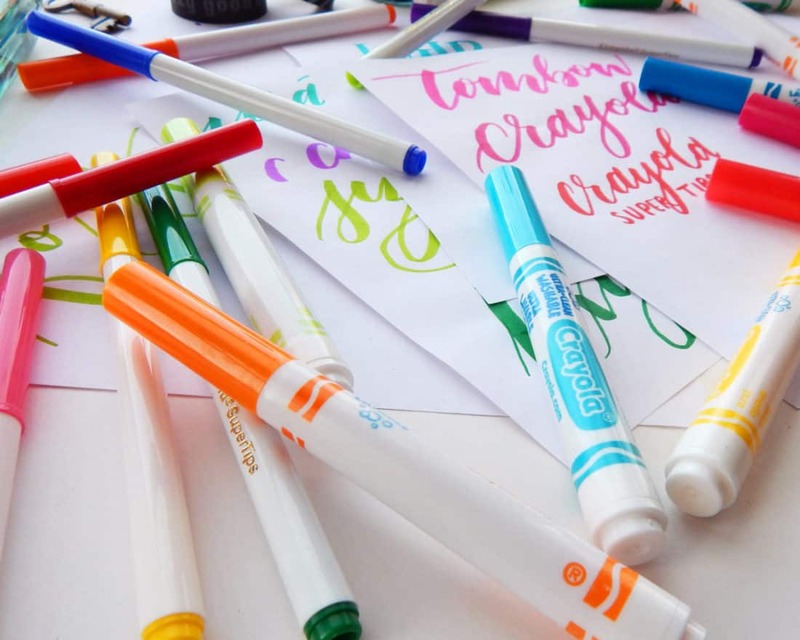 For experienced calligraphers and novices alike, you need to try using Crayola markers. They are a fun tool that can open up a wide range of lettering opportunities. Plus they are great for practice or trying new techniques. And you can’t beat the level of nostalgia you feel while using them. What kid didn’t covet the full box set of these markers? Now you can get them and make something much cooler than you ever expected, all without breaking the bank! That’s the best bang for my buck that I can ask for. P.S. If you sign up for the Fox Den Resource Library here or in the sidebar, you can get access to all of my free lettering printables! Go grab them now! LOVE! I’m a huge fan of Crayola markers! I am too, Pam! We’ve all got some laying around so why not put them to good use, right?! FYI crayola actually make brush markers. you get 5 in a set – red, yellow, green, blue, purple. they’re nothing fancy, but inexpensive and excellent for learning with. Yes, they do Su! These are just a great option and people tend to have them already. ? this is very informative Shelby, thank you!! I picked up brush lettering a few months ago with 3 types of brush markers, and have decided to make a video on it. I want to share this post on my channel (if you don’t mind) when I post the video, as a great and cheap alternative to brush markers! Please share away, Michelle! I’m thrilled you found this helpful. Thanks so much! Never realised that you can do more than just colour in with crayloa markers. Does it work with other markers? Thank you Shelby for sharing this post. It has inspired me and given me some great ideas for my upcoming projects! That’s a great question, Anh! I imagine that any marker with a similar cone-like tip that’s a little flexible can probably work with this technique. Good luck on your upcoming projects, and thanks for stopping by!